Garmin have released a new version of their popular BlueChart marine cartography series. 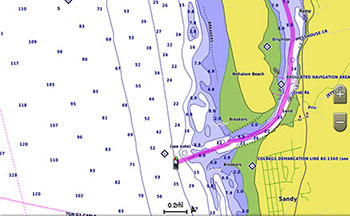 The new BlueChart marine charts named BlueChart g3 and BlueChart g2 Vision were released in February 2019 and will be compatible with Garmin marine products e.g. their chartplotter range. 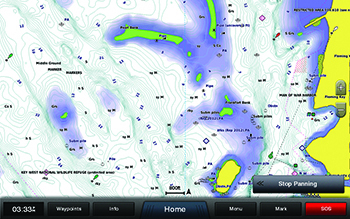 Garmin have released UK, European and North America BlueChart g3 coverage charts. Further world regions will be available in November 2019. Garmin BlueChart g3 and g3 Vision charts are now available to purchase from ActiveGPS website. The new BlueChart g3 version replace the current and out-going Garmin BlueChart g2 HD and BlueChart g2 HD Vision marine cartography series. The new marine chart data features Garmin (coastal and seas navigation) and Navionics content (inland waters), providing industry-leading coverage, clarity and detail. 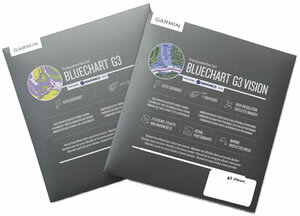 ActiveGPS are now selling the new BlueChart g3 charts by Garmin. Garmin now own Navionics which has enabled them to include Inland Waters in additional to the data previously offered by their Coastal and Sea waters BlueCharts. Whether you are fishing or cruising, select a spot, and get a route showing you the general path and nearby obstructions at a safe depth. This feature displays high-resolution Depth Range Shading for up to 10 depth ranges, so you can view your designated target depth. BlueChart g3 charts feature 30cm (1 foot) contours that provide a more accurate depiction of bottom structure for improved fishing charts and enhanced detail in swamps, canals and port plans. We offer UK, Europe and Worldwide deliveries. Garmin BlueChart orders are despatched at 3.00pm on Monday, Tuesday, Wednesday, Thursday and Friday. We need to receive your BlueChart order on those days by 1.00pm. When possible we may despatch orders received after that time. No BlueChart orders are despatched after 3.00pm and no orders are despatched on Saturday or Sunday.